Life in PJ Picklelime’s village is always a little out of the ordinary…just like PJ herself. There’s the day that Lemon Pie, a yellow warbler, came to live in her bushy crop of black hair and the morning when PJ cut her hair to help mop up an oil spill. There’s the afternoon she made sweet, memory-filled lemonade that drew people from blocks away, and the night she chatted with owls in a barn full of honey. 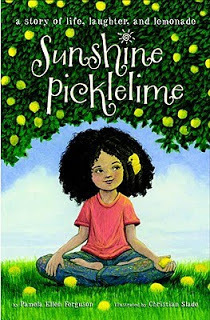 But PJ’s spring is not all roses and rainbows, and after Lemon Pie flies away, PJ’s parents split up, and a friend dies unexpectedly, PJ turns to her neighbors, with their philosophies from all over the world, for help in understanding. Can PJ find a way to recover her sunshine? Pamela Ferguson’s debut children’s novel is a treat to read, a light-hearted tale of magical realism that moves between joy and sorrow to find meaning in the roller-coaster experiences of life. How did you discover and get to know your protagonist? How about your secondary characters? 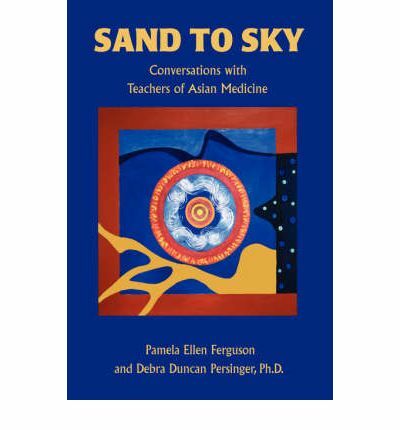 PJ Picklelime jumped into my life quite by chance during editorial sessions with co-author and dear friend Debra Duncan Persinger, PhD while we crafted the anthology Sand to Sky – Conversations with Teachers of Asian Medicine (iUniverse, 2008) during 2006. Both Debra and I had the sort of uncontrollably wildly bushy hair that was the despair of our mothers. We joked about this over editorial breakfasts of toast and lime marmalade and lunches of cheese-and-pickle sandwiches. Our hair could have nested birds! I had never written anything for children before (my nine prior books were all adult fiction and nonfiction, including major textbooks in my field of Asian Medicine). However, I used to create endless stories for my nieces when they were kids. One of my specializations is in Asian Bodywork Therapy is Pediatrics, so I have worked with kids of different ages for several years, though I’ve never met anyone like PJ! Initially, I thought I would just write a short story about PJ Picklelime who hides and rehabs a lost yellow warbler called “Lemon Pie” in her bushy hair. But nine-year-old PJ refused to let me go. And how prophetic that was. Because in my first story, written in 2006, an oil spill off PJ’s local beach prompts her to cut off her tangled curls to help fill hair booms needed to mop up the oil spill–exactly like the currently rallying cry from San Francisco based organization Matter of Trust for hair to help fill booms to mop up the Gulf oil disaster. That opening theme went on to set the book. PJ continues to help rehab other birds and animals, who become secondary characters. Lemon Pie, the yellow warbler, helps rehab gulls orphaned by the oil spill before he journeys across the ocean to new adventures off the east coast of Southern Africa. One scene rolled into another quite spontaneously in my imagination. As oceans have played a large part in my upbringing in Cornwall (UK) and Cape Town (South Africa) and countless ocean crossings, it was a joy to bring the characters of the ocean and seagulls into PJ’s life. Human secondary characters evolved easily out of the very global collection of neighbors and friends surrounding PJ in a village of computer experts employed by a company in a country I never actually identify. PJ interacts with Mrs. Patel from Madras, India, Mrs. Martins from Cape Town, South Africa, Ms. Lenz from Basel, Switzerland, and Mr Santos from Seville Spain, among a range of neighbors and teachers from Christian, Jewish, Muslim, and Buddhist backgrounds. As my own life has been global, I loved crafting such a mixed microcosm of characters. All play a crucial role in PJ’s eventual mystical quest when she grapples her way through her parents’ separation and the sudden death of a friend. In many ways, I discovered that PJ asks the same questions and seeks the same eclectic range of wise friends and animals that I sought as a nine year old. She also races around on a bicycle and does crazy things like sliding out of her window at night to look at the moon and search for owls. I was like that as a child. But my protagonist really created herself with very little effort on my part! As a contemporary fiction writer, how did you deal with the pervasiveness of rapidly changing technologies? Did you worry about dating your manuscript? Did you worry about it seeming inauthentic if you didn’t address these factors? Why or why not? Interestingly enough, one of the reviewers of Sunshine Picklelime on Amazon.com praised my involvement of tech details, none of which were domineering but happened quite spontaneously during the writing. My great editor, Jen Arena at Random House, advised me to avoid specific brand names, which made perfect sense, but turned out to be quite a challenge when a brand name (like Flip) also described the camera. We overcame this by using terms like “a little palm-size camcorder.” Yes, the kids in Sunshine Picklelime listen to music on their laptop in a tree house, they upload their news clips from camcorder to local media websites, they use cell phones, but not obsessively so. Tech items date very quickly. So, it’s vital to use terms and items that won’t date too quickly, but balance themselves in universal thoughts, and descriptions that won’t date at all, like fun lessons in nature or the weather. Also PJ Picklelime watches in fascination when neighbor Mrs Patel uses a stick shift in her VW Beetle–quite a contrast to PJ’s parents’ cars with their automatic gears. We forget that young kids grow up with modern gadgets but actually get a kick out of seeing things that work in different ways. Writers can certainly weave these contrasts into modern texts quite effectively. This was wonderfully surprising for me as it meant I was on the right track when my character PJ was fascinated by an old VW with a stick shift! So, no, I don’t worry at all about my book becoming outdated. Similarly, a friend emailed me from Rome, Italy to say her grandson was fascinated by the long metal activator she used to light her gas stove. His parents’ stove lit up at the push of a button. So maybe this will encourage more writers to spark the imagination of their young readers with a few technical contrasts from the past. I think I’ll throw a little portable clackity-clack typewriter owned by some eccentric character into my next book, to show a contrast to, say, an iPad! In short, writers don’t need to fall over themselves to include super high-tech gadgets. Just let them appear spontaneously in appropriate moments. As writing for children is a gift for anyone with a florid imagination, authors can have a lot of fun creating super high-tech items not yet on the market. Or, to be environmentally conscious, introduce characters who use items like solar-powered radios or laptops. Or, if a character uses earphones obsessively for work, study, communicating with friends, etc., a parent could express anxiety about the impact on their hearing down the line (yes, a very real problem), not to mention the dangers of listening to iPods or taking phone calls while walking or cycling in traffic. So, by adding some real concern, or some character insight prompted by a specific tech item, or by building humor into a scene involving some ridiculous misuse of a high-tech item–“Grandpa kept telling the TomTom to switch CDs”–a writer can devise ways to move the story along without a fear of sounding dated. From Random House: Only a person who has lived as richly as Pamela Ellen Ferguson could create such a textured work of fiction. She was born in Mexico, grew up in Britain and South Africa, and has lived and worked in over a dozen world capitals. A former journalist in London’s Fleet Street, she is now a leading instructor in Zen Shiatsu, and her books for adults, both fiction and nonfiction, have been translated into several languages. Pamela lives in Austin, Texas, surrounded by a garden with cacti as tall as trees. 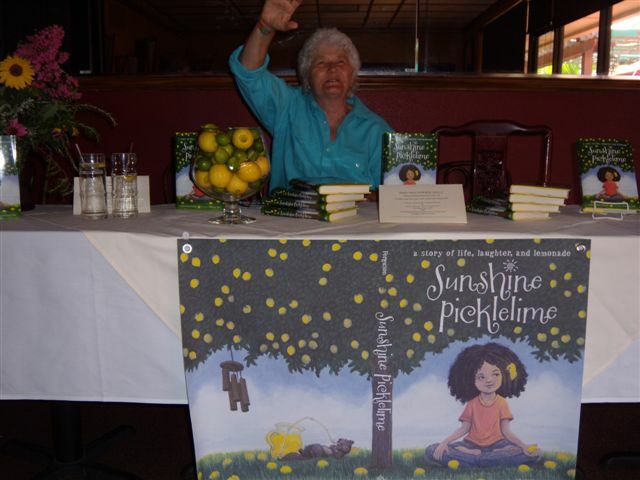 Sunshine Picklelime is her first book for children.